San Francisco's annual 'Architecture in the City' home tours are stepping outside of the city this year to include a very special home in Hillsborough—the 'House of Earth and Sky,' a newly built home that consumes zero energy and has walls of rammed earth and a perky butterfly roof. The 'San Francisco Living: Home Tours,' which is just one component of the month-long Architecture and the City Festival throughout September, take place Saturday, September 26 and Sunday, September 27. Homes to be viewed are in the city's upscale Presidio (John Maniscalco Architecture), Cow Hollow (M-PROJECTS with Larson Shores Architecture + Interiors), and Buena Vista (Rodgers Architecture) neighborhoods. On Saturday, tourists can also visit Hunters View Housing, a complex of subsidized and market-rate housing at Hunters Point, part of the city's effort to improve this long-troubled neighborhood. The architect is Paulett Taggart Architects. The Hillsborough house will be open for tours on Sunday. A better look, thanks to the architects, of the Hillsborough butterfly roof. The home tours, and the entire festival, are sponsored by AIA San Francisco (American Institute of Architects) and the Center for Architecture + Design. Other festival events that could appeal to a general audience include lecture and panel discussions, activities for kids and families (some at the Contemporary Jewish Museum in San Francisco, September 13 and 27), and an interactive virtual-reality workshop for adults, apparently, on September 18. The Eichler Network spoke to Joshua Aidlin, of the firm Aidlin Darling Design, about the Hillsborough house as construction was just getting underway. 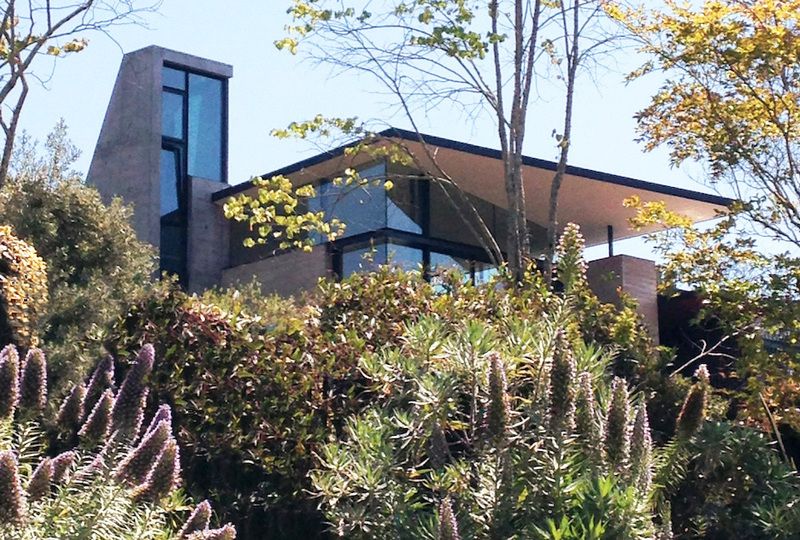 The home was cited in our article on the lore and lure of butterfly-roofed homes in the Spring 2014 CA-Modern magazine. Although often appreciated for its jaunty look, a butterfly roof in this case proved supremely functional. The LEED-Platinum home is ecologically sound in several ways. It uses earth from the site to form walls that provide thermal mass. And, the design firm says, "Lightweight roof planes orient photovoltaics toward the sun, guide rainwater to cisterns, and provide shade through calibrated overhangs." "The roof-scape form is intentional," Aidlin said during the interview. "It can hide solar panels and provide perfect drainage to collect rainwater." He added, "It also allows the views to be opened up." "We're literally floating these two roofs off of rammed earth walls that are two feet and four feet thick," Aidlin said. "This sustainable home celebrates the intersection of earth and sky," according to Aidlin Darling. "One enters below grade and ascends vertically through the ground to arrive in a series of glass pavilions, anchored by rammed earth walls and sheltered under kite-like floating roofs." For more on this year's 'San Francisco Living: Home Tours,' click here.